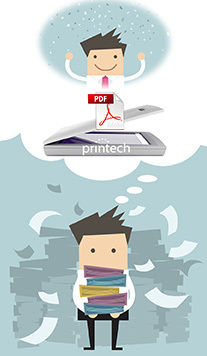 Let us scan your paper files and convert them to PDF files. Any amount of pages from as little as 5 or 10 pages up to hundreds or thousands of pages. We can save them to CD, DVD, or USB device for compact storage. As little as 10¢ per page plus a minimal set up fee. Contact us to get a quote or get more information about scanning your files to PDF.